"European Champions League" and "European Cup" redirect here. For the table tennis competition, see European Champions League (table tennis). For the trophy, see European Champion Clubs' Cup. For other uses, see European Cup (disambiguation). This article is about the men's competition. For the women's competition, see UEFA Women's Champions League. The UEFA Champions League (abbreviated as UCL) is an annual club football competition organised by the Union of European Football Associations (UEFA) and contested by top-division European clubs. It is one of the most prestigious tournaments in the world and the most prestigious club competition in European football, played by the national league champions (and, for some nations, one or more runners-up) of the strongest UEFA national associations. Introduced in 1955 as the European Champion Clubs' Cup, more commonly known as the European Cup, it was initially a straight knockout tournament open only to the champion club of each national championship. The competition took on its current name in 1992, adding a round-robin group stage and allowing multiple entrants from certain countries. It has since been expanded, and while most of Europe's national leagues can still only enter their champion, the strongest leagues now provide up to five teams. Clubs that finish next-in-line in their national league, having not qualified for the Champions League, are eligible for the second-tier UEFA Europa League competition. In its present format, the Champions League begins in late June with four knockout qualifying rounds and a play-off round. The 6 surviving teams enter the group stage, joining 26 teams qualified in advance. The 32 teams are drawn into eight groups of four teams and play each other in a double round-robin system. The eight group winners and eight runners-up proceed to the knockout phase that culminates with the final match in May. The winner of the Champions League qualifies for the UEFA Super Cup and the FIFA Club World Cup. The competition has been won by 22 clubs, 12 of which have won it more than once. Real Madrid is the most successful club in the tournament's history, having won it 13 times, including its first five seasons. Real Madrid are also the reigning champions; they defeated Liverpool 3–1 in the 2018 final and became the first team in the Champions League era to win the title for three years in a row. Spanish clubs have the highest number of victories (18 wins), followed by England and Italy (12 wins apiece). England has the largest number of winning teams, with five clubs having won the title. Real Madrid successfully defended the trophy next season in their home stadium, the Santiago Bernabéu, against Fiorentina. After a scoreless first half, Real Madrid scored twice in six minutes to defeat the Italians. In 1958, Milan failed to capitalise after going ahead on the scoreline twice, only for Real Madrid to equalise. The final held in Heysel Stadium went to extra time where Francisco Gento scored the game-winning goal to allow Real Madrid to retain the title for the third consecutive season. In a rematch of the first final, Real Madrid faced Stade Reims at the Neckarstadion for the 1958–59 season final, easily winning 2–0. West German side Eintracht Frankfurt became the first non-Latin team to reach the European Cup final. The 1959–60 season finale still holds the record for the most goals scored, with Real Madrid beating Eintracht Frankfurt 7-3 in Hampden Park, courtesy of four goals by Ferenc Puskás and a hat-trick by Alfredo Di Stéfano. This was Real Madrid's fifth consecutive title, a record that still stands today. 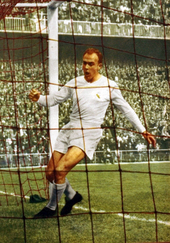 Real Madrid's reign ended in the 1960–61 season when bitter rivals Barcelona dethroned them in the first round. Barcelona themselves, however, would be defeated in the final by Portuguese side Benfica 3–2 at Wankdorf Stadium. Reinforced by Eusébio, Benfica defeated Real Madrid 5–3 at the Olympic Stadium in Amsterdam and kept the title for a second, consecutive season. Benfica wanted to repeat Real Madrid's successful run of the 1950s after reaching the showpiece event of the 1962–63 European Cup, but a brace from Brazilian-Italian José Altafini at the Wembley Stadium gave the spoils to Milan, making the trophy leave the Iberian Peninsula for the first time ever. Internazionale beat an ageing-Real Madrid 3–1 in the Ernst-Happel-Stadion to win the 1963–64 season and replicate their local-rival's success. The title stayed in the city of Milan for the third year in a row after Inter beat Benfica 1–0 at their home ground, the San Siro. "Magic...it’s magic above all else. When you hear the anthem it captivates you straight away." The chorus contains the three official languages used by UEFA: English, German, and French. The climactic moment is set to the exclamations ‘Die Meister! Die Besten! Les Grandes Équipes! The Champions!’. 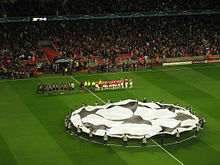 The anthem's chorus is played before each UEFA Champions League game as the two teams are lined up, as well as at the beginning and end of television broadcasts of the matches. In addition to the anthem, there is also entrance music, which contains parts of the anthem itself, which is played as teams enter the field. The complete anthem is about three minutes long, and has two short verses and the chorus. Special vocal versions have been performed live at the Champions League Final with lyrics in other languages, changing over to the host nation's language for the chorus. These versions were performed by Andrea Bocelli (Italian) (Rome 2009, Milan 2016 and Cardiff 2017), Juan Diego Flores (Spanish) (Madrid 2010), All Angels (Wembley 2011), Jonas Kaufmann and David Garrett (Munich 2012), and Mariza (Lisbon 2014). In the 2013 final at Wembley Stadium, the chorus was played twice. In Kiev 2018, the instrumental version of the chorus was played by 2Cellos. The anthem has been released commercially in its original version on iTunes and Spotify with the title of Champions League Theme. In 2018, composer Hans Zimmer remixed the anthem with rapper Vince Staples for EA Sports’ FIFA video game FIFA 19, with it also featuring in the game's reveal trailer. Since the 2009–10 season, the UEFA Champions League begins with a double round-robin group stage of 32 teams, which is preceded by two qualification 'streams' for teams that do not receive direct entry to the tournament proper. The two streams are divided between teams qualified by virtue of being league champions, and those qualified by virtue of finishing 2nd–4th in their national championship. Four of the remaining six qualifying places are granted to the winners of a six-round qualifying tournament between the remaining 43 or 44 national champions, within which those champions from associations with higher coefficients receive byes to later rounds. The other two are granted to the winners of a three-round qualifying tournament between the 11 clubs from the associations ranked 5 through 15, which have qualified based upon finishing second, or third in their respective national league. In 2005–06 season, Liverpool and Artmedia Bratislava became the first teams to reach the Champions League group stage after playing in all three qualifying rounds. In 2008–09 season, both BATE Borisov and Anorthosis Famagusta achieved the same feat. Real Madrid holds the record for the most consecutive appearances in the group stage, having qualified 22 times in a row (1997–present). They are followed by Arsenal on 19 (1998–2016) and Manchester United on 18 (1996–2013). Between 2003 and 2008, no differentiation was made between champions and non-champions in qualification. The 16 top ranked teams spread across the biggest domestic leagues qualified directly for the tournament group stage. Prior to this, three preliminary knockout qualifying rounds whittled down the remaining teams, with teams starting in different rounds. An exception to the usual European qualification system happened in 2005, after Liverpool won the Champions League the year before, but did not finish in a Champions League qualification place in the Premier League that season. UEFA gave special dispensation for Liverpool to enter the Champions League, giving England five qualifiers. UEFA subsequently ruled that the defending champions qualify for the competition the following year regardless of their domestic league placing. However, for those leagues with four entrants in the Champions League, this meant that, if the Champions League winner fell outside of its domestic league's top four, it would qualify at the expense of the fourth-placed team in the league. Until 2015–16, no association could have more than four entrants in the Champions League. In May 2012, Tottenham Hotspur finished fourth in the 2011–12 Premier League, two places ahead of Chelsea, but failed to qualify for the 2012–13 Champions League, after Chelsea won the 2012 final. Tottenham were demoted to the 2012–13 UEFA Europa League. In May 2013, it was decided that, starting from the 2015–16 season (and continuing at least for the three-year cycle until the 2017–18 season), the winners of the previous season's UEFA Europa League would qualify for the UEFA Champions League, entering at least the play-off round, and entering the group stage if the berth reserved for the Champions League title holders was not used. The previous limit of a maximum of four teams per association was increased to five, meaning that a fourth-placed team from one of the top three ranked associations would only have to be moved to the Europa League if both the Champions League and Europa League winners came from that association and both finished outside the top four of their domestic league. In 2007, Michel Platini, the UEFA president, had proposed taking one place from the three leagues with four entrants and allocating it to that nation's cup winners. This proposal was rejected in a vote at a UEFA Strategy Council meeting. In the same meeting, however, it was agreed that the third-placed team in the top three leagues would receive automatic qualification for the group stage, rather than entry into the third qualifying round, while the fourth-placed team would enter the play-off round for non-champions, guaranteeing an opponent from one of the top 15 leagues in Europe. This was part of Platini's plan to increase the number of teams qualifying directly into the group stage, while simultaneously increasing the number of teams from lower-ranked nations in the group stage. The tournament proper begins with a group stage of 32 teams, divided into eight groups. Seeding is used whilst making the draw for this stage, whilst teams from the same nation may not be drawn into groups together. Each team meets the others in its group home and away in a round-robin format. The winning team and the runners-up from each group then progress to the next round. The third-placed team enters the UEFA Europa League. The group stage is played from September to December, whilst the knock-out stage starts in February. The knock-out ties are played in a two-legged format, with the exception of the final. The final is typically held in the last two weeks of May. Changes will be made to the access list above, if the Champions League and/or Europa League title holders qualify for the tournament via their domestic leagues. If the Champions League title holders qualify for the group stage via their domestic league, the champions of association 11 (Austria) will enter the group stage, and champions of the highest-ranked associations in earlier rounds will also be promoted accordingly. If the Europa League title holders qualify for the group stage via their domestic league, the third-placed team of association 5 (France) will enter the group stage, and runners-up of the highest-ranked associations in the second qualifying round will also be promoted accordingly. If the Champions League and/or Europa League title holders qualify for the qualifying rounds via their domestic league, their spot in the qualifying rounds is vacated, and teams of the highest-ranked associations in earlier rounds will be promoted accordingly. An association may have a maximum of five teams in the Champions League. Therefore, if both the Champions League and Europa League title holders come from the same top-four association and finish outside of the top four of their domestic league, the fourth-placed team of the league will not compete in the Champions League and will instead compete in the Europa League. In August 2016, UEFA announced changes in the access list of the tournament, driven to avoid the creation of a European Super League. The top four clubs from the four top-ranked national associations will receive guaranteed qualification automatically for the group stage. The Europa League holders also will automatically qualify for the group stage. However, the plan passed by UEFA caused outrage among smaller associations. After his election as the new UEFA president, Aleksander Čeferin said that he would review the new system. In December 2016, UEFA confirmed the plan will go on. If the Champions League title holders qualify for the group stage via their domestic league, the champions of association 11 will enter the group stage, and champions of the highest-ranked associations in earlier rounds will also be promoted accordingly. If the Europa League title holders qualify for the group stage via their domestic league, the third-placed team of association 5 will enter the group stage, and runners-up of the highest-ranked associations in the second qualifying round will also be promoted accordingly. If the Champions League or Europa League title holders qualify for the qualifying rounds via their domestic league, their spot in the qualifying rounds is vacated, and teams of the highest-ranked associations in earlier rounds will be promoted accordingly. In co-operation with the UEFA Refereeing Unit, the UEFA Referee Committee is responsible for appointing referees to matches. Referees are appointed based on previous matches, marks, performances, and fitness levels. To discourage bias, the Champions League takes nationality into account. No referee may be of the same origins as any club in his or her respecting groups. Referee appointments, suggested by the UEFA Refereeing Unit, are sent to the UEFA Referee Committee to be discussed or revised. After a consensus is made, the name of the appointed referee remains confidential up to two days before the match for the purpose of minimising public influence. Each year, the winning team is presented with the European Champion Clubs' Cup, the current version of which has been awarded since 1967. 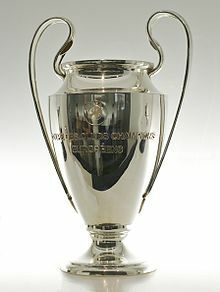 Any team that wins the Champions League three years in a row or five times overall wins the right to retain a full-sized replica of the trophy (UEFA retains the original at all times). Six clubs have earned this honour: Real Madrid, Ajax, Bayern Munich, Milan, Liverpool and Barcelona. Since then instead the club which wins three years in a row or five overall receives a commemorative badge to wear permanently on their uniform. This means that at best, a club can earn €82,450,000 of prize money under this structure, not counting shares of the qualifying rounds, play-off round or the market pool. A large part of the distributed revenue from the UEFA Champions League is linked to the "market pool", the distribution of which is determined by the value of the television market in each nation. For the 2014–15 season, Juventus, who were the runners-up, earned nearly €89.1 million in total, of which €30.9 million was prize money, compared with the €61.0 million earned by Barcelona, who won the tournament and were awarded €36.4 million in prize money. Adidas is a secondary sponsor and supplies the official match ball, the Adidas Finale, and referee uniform. Hublot is also a secondary sponsor as the official fourth official board of the competition. Individual clubs may wear jerseys with advertising. However, only one sponsorship is permitted per jersey in addition to that of the kit manufacturer. Exceptions are made for non-profit organisations, which can feature on the front of the shirt, incorporated with the main sponsor or in place of it; or on the back, either below the squad number or on the collar area. If clubs play a match in a nation where the relevant sponsorship category is restricted (such as France's alcohol advertising restriction), then they must remove that logo from their jerseys. For example, when Rangers played French sides Auxerre and Strasbourg in the 1996–97 Champions League and the UEFA Cup, respectively, Rangers players wore the logo of Center Parcs instead of McEwan's Lager (both companies at the time were subsidiaries of Scottish & Newcastle). The competition attracts an extensive television audience, not just in Europe, but throughout the world. The final of the tournament has been, in recent years, the most-watched annual sporting event in the world. The final of the 2012–13 tournament had the competition's highest TV ratings to date, drawing approximately 360 million television viewers. A ^ Includes clubs representing West Germany. No clubs representing East Germany appeared in a final. The table below does not include goals scored in the qualification stage. The table below does not include appearances made in the qualification stage. ^ Giggs had 4 European Cup + 141 Champions League matches. ^ Maldini had 26 European Cup + 109 Champions League matches. ^ a b c "Football's premier club competition". Union of European Football Associations. 31 January 2010. Retrieved 23 May 2010. ^ "Clubs". Union of European Football Associations. 31 January 2010. Retrieved 23 May 2010. ^ "UEFA Europa League further strengthened for 2015–18 cycle". Union of European Football Associations. 24 May 2013. Retrieved 2 August 2013. ^ "Matches". Union of European Football Associations. 31 January 2010. Retrieved 23 May 2010. ^ "Club competition winners do battle". Union of European Football Associations. 31 January 2010. Retrieved 23 May 2010. ^ "FIFA Club World Cup". Fédération Internationale de Football Association. Retrieved 30 December 2013. ^ a b "European Champions' Cup". Rec.Sport.Soccer Statistics Foundation. 31 January 2010. Retrieved 23 May 2010. ^ García, Javier; Kutschera, Ambrosius; Schöggl, Hans; Stokkermans, Karel (2009). "Austria/Habsburg Monarchy – Challenge Cup 1897–1911". Rec.Sport.Soccer Statistics Foundation. Retrieved 5 September 2011. ^ Stokkermans, Karel (2009). "Mitropa Cup". Rec.Sport.Soccer Statistics Foundation. ^ a b Ceulemans, Bart; Michiel, Zandbelt (2009). "Coupe des Nations 1930". Rec.Sport.Soccer Statistics Foundation. Retrieved 5 September 2011. ^ Stokkermans, Karel; Gorgazzi, Osvaldo José (2006). "Latin Cup". Rec.Sport.Soccer Statistics Foundation. Retrieved 5 September 2011. ^ "Primeira Libertadores – História (Globo Esporte 09/02/20.l.08)". Youtube.com. Retrieved 14 August 2010. ^ a b c d e f "1955/56 European Champions Clubs' Cup". Union of European Football Associations. 31 January 2010. Retrieved 23 May 2010. ^ a b c d e f "European Champions' Cup 1955–56 – Details". Rec.Sport.Soccer Statistics Foundation. 31 January 2010. Retrieved 23 May 2010. ^ a b c d e f "Trofeos de Fútbol". Real Madrid. 31 January 2010. Archived from the original on 3 October 2009. Retrieved 23 May 2010. ^ a b "1956/57 European Champions Clubs' Cup". Union of European Football Associations. 31 January 2010. Retrieved 23 May 2010. ^ a b "Champions' Cup 1956–57". Rec.Sport.Soccer Statistics Foundation. 31 January 2010. Retrieved 23 May 2010. ^ a b "1957/58 European Champions Clubs' Cup". Union of European Football Associations. 31 January 2010. Retrieved 23 May 2010. ^ a b "Champions' Cup 1957–58". Rec.Sport.Soccer Statistics Foundation. 31 January 2010. Retrieved 23 May 2010. ^ "1958/59 European Champions Clubs' Cup". Union of European Football Associations. 31 January 2010. Retrieved 23 May 2010. ^ "Champions' Cup 1958–59". Rec.Sport.Soccer Statistics Foundation. 31 January 2010. Retrieved 23 May 2010. ^ a b "1959/60 European Champions Clubs' Cup". Union of European Football Associations. 31 January 2010. Retrieved 23 May 2010. ^ a b "Champions' Cup 1959–60". Rec.Sport.Soccer Statistics Foundation. 31 January 2010. Retrieved 23 May 2010. ^ a b "1960/61 European Champions Clubs' Cup". Union of European Football Associations. 31 January 2010. Retrieved 23 May 2010. ^ a b "Champions' Cup 1960–61". Rec.Sport.Soccer Statistics Foundation. 31 January 2010. Retrieved 23 May 2010. ^ a b "Anos 60: A "década de ouro"". Sport Lisboa e Benfica. 31 January 2010. Retrieved 23 May 2010. ^ "1961/62 European Champions Clubs' Cup". Union of European Football Associations. 31 January 2010. Retrieved 23 May 2010. ^ "Champions' Cup 1961–62". Rec.Sport.Soccer Statistics Foundation. 31 January 2010. Retrieved 23 May 2010. ^ "1962/63 European Champions Clubs' Cup". Union of European Football Associations. 31 January 2010. Retrieved 23 May 2010. ^ "Champions' Cup 1962–63". Rec.Sport.Soccer Statistics Foundation. 31 January 2010. Retrieved 23 May 2010. ^ "Coppa Campioni 1962/63". Associazione Calcio Milan. 31 January 2010. Retrieved 23 May 2010. ^ "1963/64 European Champions Clubs' Cup". Union of European Football Associations. 31 January 2010. Retrieved 23 May 2010. ^ "Champions' Cup 1963–64". Rec.Sport.Soccer Statistics Foundation. 31 January 2010. Retrieved 23 May 2010. ^ "Palmares: Prima coppa dei campioni – 1963/64" (in Italian). FC Internazionale Milano. 31 January 2010. Retrieved 23 May 2010. ^ "1964/65 European Champions Clubs' Cup". Union of European Football Associations. 31 January 2010. Retrieved 23 May 2010. ^ "Champions' Cup 1964–65". Rec.Sport.Soccer Statistics Foundation. 31 January 2010. Retrieved 23 May 2010. ^ "Palmares: Prima coppa dei campioni – 1964/65" (in Italian). FC Internazionale Milano. 31 January 2010. Retrieved 23 May 2010. ^ "The story of the UEFA Champions League anthem". YouTube. UEFA. Retrieved 17 August 2018. ^ a b c "From Handel to Hala Madrid: music of champions". UEFA. Retrieved 16 August 2017. ^ Media, democracy and European culture. Intellect Books. 2009. p. 129. Retrieved 14 September 2014. ^ a b "What is the Champions League music? The lyrics and history of one of football's most famous songs". Wales Online. Retrieved 17 August 2018. ^ Fornäs, Johan (2012). Signifying Europe (PDF). Bristol, England: intellect. pp. 185–187. ^ "UEFA Champions League entrance music". YouTube. Retrieved 17 August 2018. ^ "2Cellos to perform UEFA Champions League anthem in Kyiv". UEFA. Retrieved 17 August 2018. ^ "Behind the Music: Champions League Anthem Remix with Hans Zimmer". Electronic Arts. 12 June 2018. Retrieved 13 August 2018. ^ King, Anthony. (2004). The new symbols of European football. International Review for the Sociology of Sport 39(3). London, Thousand Oaks, CA, New Delhi. ^ TEAM. (1999). UEFA Champions League: Season Review 1998/9. Lucerne: TEAM. ^ "The official website for European football – UEFA.com". Retrieved 14 September 2014. ^ "EuroFutbal – Manchester United". ^ "Liverpool get in Champions League". BBC Sport. BBC. 10 June 2005. Retrieved 11 December 2007. ^ "EXCO approves new coefficient system". UEFA. 20 May 2008. Archived from the original on 21 May 2008. Retrieved 12 September 2010. ^ a b "Harry Redknapp and Spurs given bitter pill of Europa League by Chelsea". The Guardian. Guardian News and Media. 20 May 2012. Retrieved 24 November 2012. ^ "Added bonus for UEFA Europa League winners". UEFA.org. Union of European Football Associations. 24 May 2013. ^ "UEFA Access List 2015/18 with explanations" (PDF). Bert Kassies. ^ Bond, David (13 November 2007). "Clubs force UEFA's Michel Platini into climbdown". The Daily Telegraph. Retrieved 2 December 2007. ^ "Platini's Euro Cup plan rejected". BBC Sport. BBC. 12 December 2007. Retrieved 11 December 2007. ^ "Arsène Wenger says Champions League place is a 'trophy'". Guardian. Retrieved 15 May 2014. ^ "Arsenal's Trophy Cabinet". Talk Sport. Retrieved 15 May 2014. ^ "Regulations of the UEFA Champions League 2011/12, pg 10:". UEFA.com. ^ "Evolution of UEFA club competitions from 2018". uefa.com. UEFA. 26 August 2016. ^ "New Uefa president Aleksander Ceferin vows to review Champions League deal". The Gardian. 14 September 2016. ^ a b "UEFA Champions League Statistics Handbook 2018/19" (pdf). UEFA.com. Union of European Football Associations (UEFA). pp. 4, 7. Retrieved 3 October 2018. ^ a b c "UEFA Referee". Uefa.com. 7 July 2010. Retrieved 24 July 2011. ^ "The UEFA Champions League trophy". uefa.com. Retrieved 6 June 2017. ^ "2012/13 Season" (PDF). Regulations of the UEFA Champions League: 2012–15 Cycle. UEFA. p. 8. Retrieved 22 September 2012. ^ UEFA.com. "How clubs' 2018/19 UEFA Champions League revenue will be shared". UEFA.com. Retrieved 5 June 2018. ^ "Clubs benefit from Champions League revenue" (PDF). uefadirect. Union of European Football Associations (1): 1. October 2015. Retrieved 16 October 2015. ^ Thompson, Craig; Magnus, Ems (February 2003). "The Uefa Champions League Marketing" (PDF). Fiba Assist Magazine: 49–50. Archived from the original (PDF) on 28 May 2008. Retrieved 19 May 2008. ^ "Regulations of the UEFA Champions League 2015–18 Cycle – 2015/2016 Season – Article 66 – Other Requirements" (PDF). UEFA.org. UEFA. Retrieved 30 June 2015. ^ "UEFA Champions League - UEFA.com". UEFA.com. Retrieved 2 July 2015. ^ "Uefa Champions League checks in with Expedia". SportsPro. Retrieved 15 August 2018. 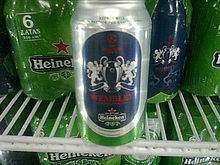 ^ "HEINEKEN extends UEFA club competition sponsorship". UEFA.com. Retrieved 12 February 2018. ^ Carp, Sam. "Uefa cashes in Mastercard renewal". SportsPro. Retrieved 12 February 2018. ^ "Nissan renews UEFA Champions League Partnership". UEFA.com. Retrieved 12 February 2018. ^ "PepsiCo renews UEFA Champions League Partnership". UEFA.com. UEFA. Retrieved 12 February 2018. ^ "Banco Santander to become UEFA Champions League Partner". UEFA.com. Retrieved 12 February 2018. ^ "PlayStation® extends UEFA Champions League Partnership". UEFA.com. UEFA. Retrieved 29 May 2018. ^ "adidas extends European club football partnership". UEFA.org. 15 December 2011. Retrieved 30 June 2015. ^ "Hublot to partner Champions League and Europa League". UEFA.com. ^ "UEFA Kit Regulations Edition 2012" (PDF). UEFA. pp. 37, 38. Retrieved 29 January 2014. ^ Devlin, John (3 July 2009). "An alternative to alcohol". truecoloursfootballkits.com. True Colours. Retrieved 5 June 2013. Rangers have actually sported the Center Parcs logo during the course of two seasons. ^ "Champions League final tops Super Bowl for TV market". BBC Sport. British Broadcasting Corporation. 31 January 2010. Retrieved 25 February 2010. ^ Chishti, Faisal (30 May 2013). "Champions League final at Wembley drew TV audience of 360 million". Sportskeeda. Absolute Sports Private Limited. Retrieved 31 December 2013. ^ "UEFA Champions League Statistics Handbook 2018/19" (PDF). Union of European Football Associations. pp. 5–7. Retrieved 2 October 2018. Wikimedia Commons has media related to UEFA Champions League.